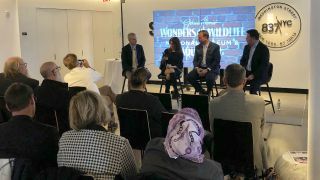 Samsung hosted a lunch discussion on Monday afternoon to kick off New York Digital Signage Week at Samsung 837, the company’s experience center located in the Meatpacking District. After some networking over food, attendees sat for an introduction from Samsung executives including Chris Mertens, VP of end user sales and B2B displays, and Shari Sentlowitz, senior manager, new product launch, who went over some of the company’s latest offerings in the video wall, LED signage, and collaboration display space, including its new Flip interactive panel. Then, Steve Hargis, creative director at Bass Pro Shops, gave a presentation on the installation of a series of Samsung video walls composed of the latest 1.7mm bezel displays at the Johnny Morris’ Wonders of Wildlife National Museum and Aquarium in Springfield, MO. Located adjacent to Bass Pro Shops’ headquarters and named for the sporting goods chain’s founder and CEO, the 350,000-square-foot facility opened last fall and has welcomed more than a million guests over the past year. Though the main draw of the attraction are its 1.5-million-gallon aquarium and its many wildlife dioramas, AV plays a big role in the experience as well. After a short video on the installation, a panel discussion provided greater detail on the planning and execution. The space’s Samsung video walls—which include several 4x4 walls and a 5x5 wall—required some interesting design work, as Hargis said the building was designed without AV in mind until the final stages. Hargis shared some of the processes he undertook to meet the compressed installation schedule. For example, to show the CEO the difference between Samsung’s bezel options, he and his team fashioned full-size examples using large-format printed pictures taped together at spaces corresponding to the bezel gaps, and demonstrated each option on the walls where the displays would go. This made the choice easy: he selected the 1.7mm model, Samsung’s smallest available bezel size, for all of the facility’s installations.